Dietary supplement. Eliminate toxins, once and for all. Does not cause bloating and flatulence. With a refreshing natural lemon flavour. Contains HEPAfiber complex™ with a unique synergistic formula of natural ingredients: acacia gum is a natural source of soluble fiber, contains minimum 90% fiber, chicory stimulates the secretion of bile and contains inulin, which promotes healthy digestion and ultimately flushes toxins from the body, rosemary increases blood circulation, further helping out the liver and lemon juice that is naturally high in citric acid that stimulates digestive juices. 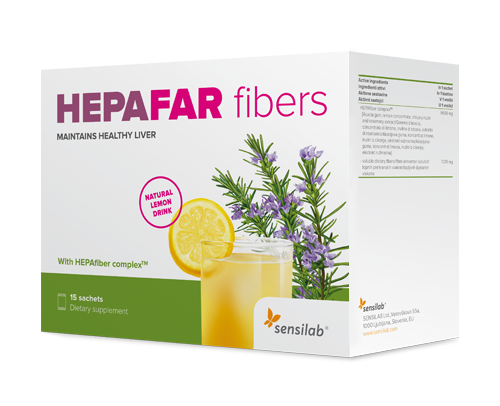 Water-soluble fibers in Hepafar Fibers play a key role in the detox process by: binding toxins, supporting overall digestion, acting as a prebiotic and preventing the proliferation of pathogenic bacteria. Active ingredients in 1 sachet: HEPAfiber complex™ (acacia gum, lemon concentrate, chicory inulin and rosemary extract) 9600 mg (soluble dietary fibers 7270 mg). Warnings: If you are hypersensitive or allergic to any of the ingredients of this product or use medication consult your doctor before use. This product is not recommended for pregnant and breastfeeding women. Important notices: Recommended daily intake should not be exceeded. Dietary supplement should not be used as a substitute for a varied and balanced diet and a healthy lifestyle. A diverse and balanced diet and a healthy lifestyle are important. The effects of using the product may vary by individuals and may differ from those described on the website. Before we can subscribe you to our newsletter, please revise the following consents. ©2016 SENSILAB pharmaceutical company Ltd.